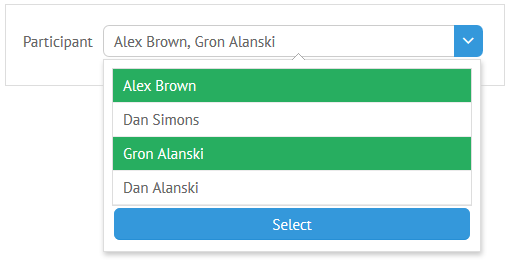 UI-related Multiselect is a non-editable select control that allows selecting multiple options at a time while displaying them in the dedicated input field. To remove an option from selection, uncheck it in the list. button (boolean) - if set to true, defines that Multiselect popup will be closed by click on the Select button. The details on the button's configuration are given below. Then all the Multiselect instances in the app will be supplied with the "Done" word. You can read more about advanced configuration options for popup selectors in the corresponding documentation article. There is a possibility to select/unselect all options of the Multiselect control. When you click "Select All", all the options are selected and the label changes to Unselect All, which allows you to unselect all the options.